Last week, ComicLink (“CLink”) and ComicConnect (“CC”) held their respective major quarterly auctions. Today, I’ll highlight some notable results and discuss the direction of these pieces’ markets. Do note that OA pieces in these quarterly auctions are generally higher-end, which explains why many have 4 or 5-figure price tags. WARNING! The following are my personal (erroneous?) opinions only. Readers should consult their professional OA adviser before making an investment decision. One of the biggest surprises was this non-costume (non-clothing actually) splash page. 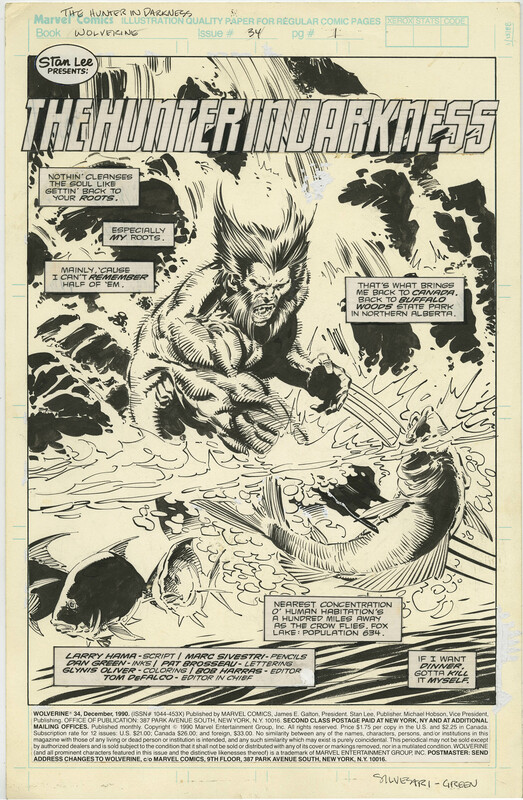 A costumed splash (but no claws) previously sold for $6,350 in February 2016, which I thought was a strong price for a Silvestri Wolverine page at the time. Silvestri OA prices have generally lagged behind the other Image founders’ (McFarlane, Lee, Larsen, Liefeld); these results could mark the elevation of his prices to their levels. I was an underbidder on this piece, and feel that the winner got a good deal at $3.2k. 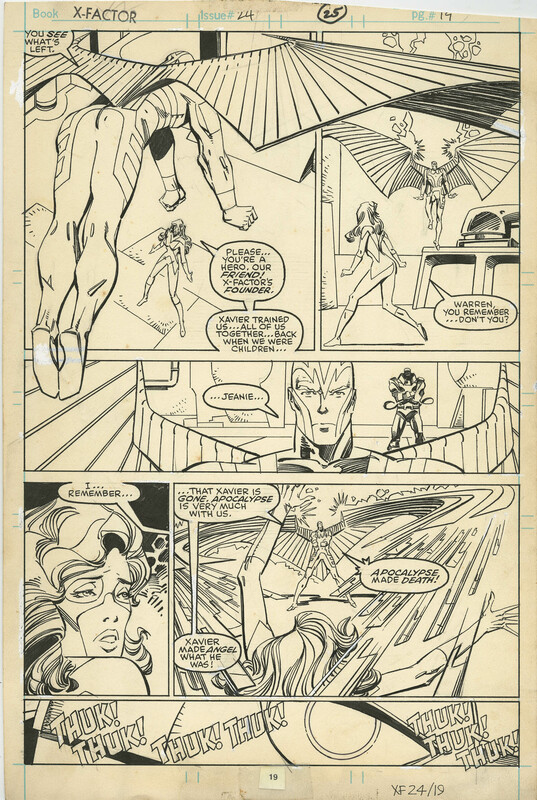 Simonson published OA is rare as he keeps most of his artwork, plus this is a page from the key 1st Appearance of Archangel issue (with dynamic Archangel action shots to boot)! My pre-auction estimate was a minimum of $4k, and I think it can fetch more than that on resale. Infinity Gauntlet (“IG”) OA lands right in my Marvel Cosmic collecting wheelhouse, so kindly indulge me as I ramble about these results. Historically, OA pages featuring Thanos have commanded a premium over other pages from the same issues/runs without Thanos. Because as we all know, Thanos rulez! This “Thanos Tax” was exacerbated by his now infamous end-credits cameo in the 2012 Avengers movie, and Thanos-related OA prices have been on a steady upward trajectory ever since. As an aside, I believe Iron Man #55 started the trend of instant, explosive price increases for previously undervalued keys upon a character's movie appearance/announcement. IM #55 is probably also the gold standard for longevity of movie books, and the 2018 & 2019 Infinity War movies should ensure more growth to come. Alright back to OA! 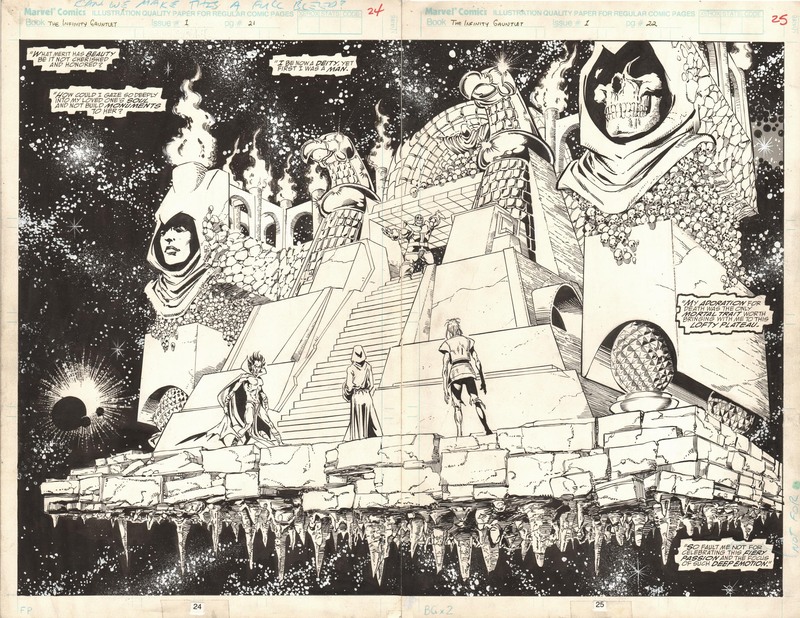 This intricately detailed double-page splash by Perez sold for about what I expected it to, and was actually held back price-wise because of the tininess of the Thanos image. Make no mistake though, $8.8k is a strong price for this piece. To illustrate the rise in prices, Perez IG Thanos panel pages cost around $2k in 2012, with non-Thanos pages going for about $500. $1.7k is a very strong price for this piece, considering that Perez IG non-Thanos panel pages featuring multiple costumed heroes currently start at around $2k. Similar to the “Thanos Tax”, the price of this piece leads me to suspect there may now also be a “Cosmic Beings Tax”. 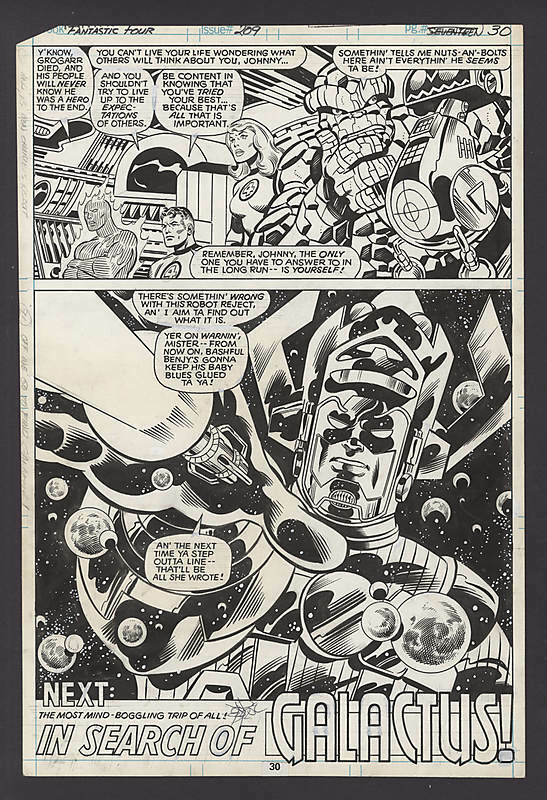 OA pages with large images of Galactus are usually in demand. 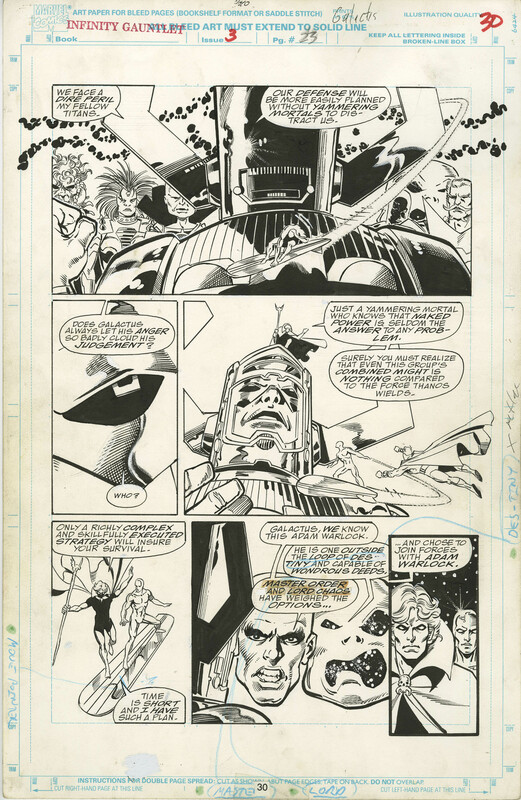 This page lacks a dominating Galactus image but does feature Big G and several other Cosmic Beings, which I believe combined to push the price up. This page sold for around $1.8k in 2014, which seemed high at the time, but not anymore! The value of Perez IG OA moves up every year, so even though prices in this CLink auction may seem high, they could well prove to be bargains down the road. I think $6.2k is a fair price for this powerful image of Spawn by his legendary Todd-father. McFarlane hangs on to almost all his Spawn artwork, so finding a piece with Todd’s pencils and inks is rare indeed. 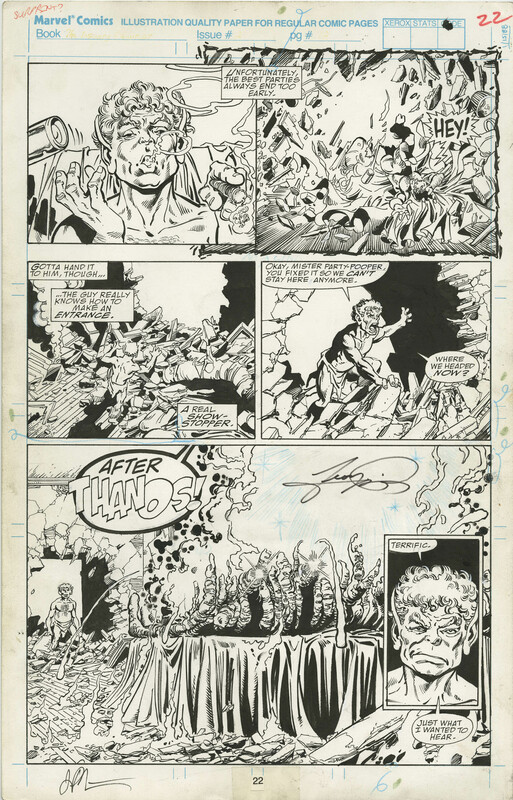 Interestingly, there are three more pages from Spawn #33 in the upcoming CLink Winter Featured Auction, so we’ll soon be able to better judge if this page was a good buy or not. Here’s a concrete example of the kind of returns OA can provide the savvy buyer. 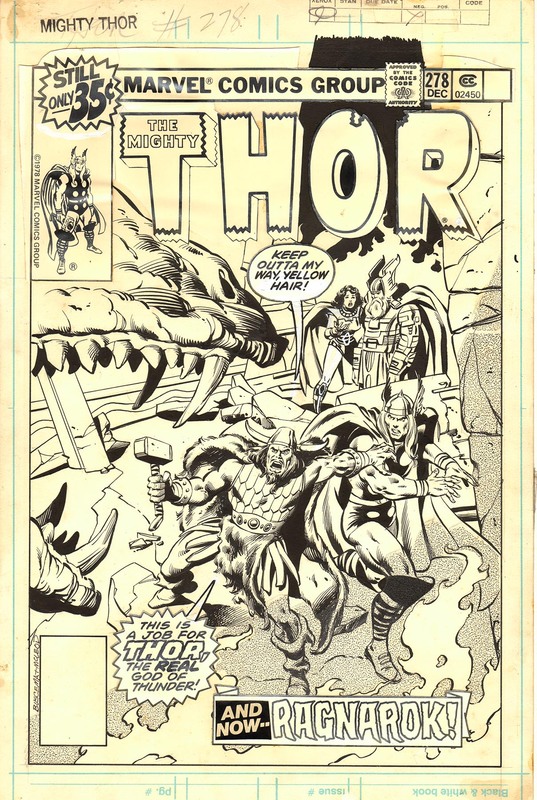 This very same Thor cover was sold by Heritage Auctions for $4,780 in February 2012; a fairly decent ROI wouldn't you say? There were three Negan pages in this auction – a smart seller capitalizing on his appearance in the latest TV season of Walking Dead? 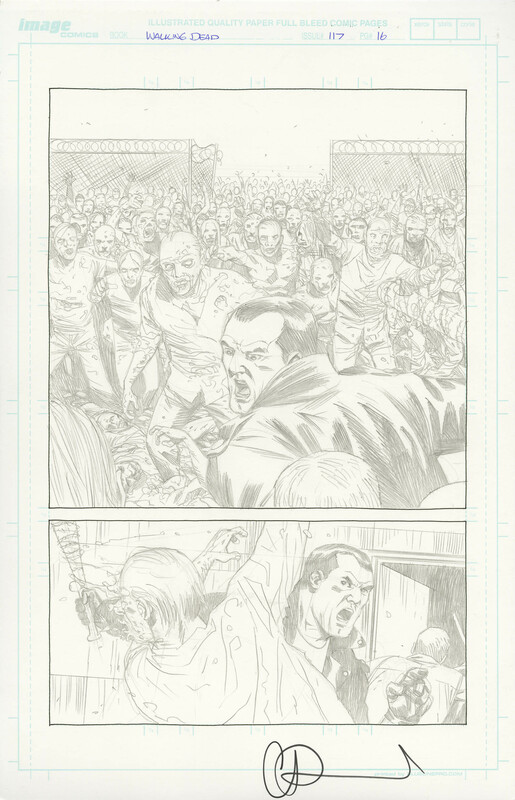 Adlard WD panel pages start at around $300; pages with “Walkers” fetch a premium. This Negan splash is a desirable piece featuring Walkers, Lucille and Negan in action, which account for its $2.1k price tag. This lot includes separate art boards with Adlard’s original pencils and Gaudiano’s blueline inks. 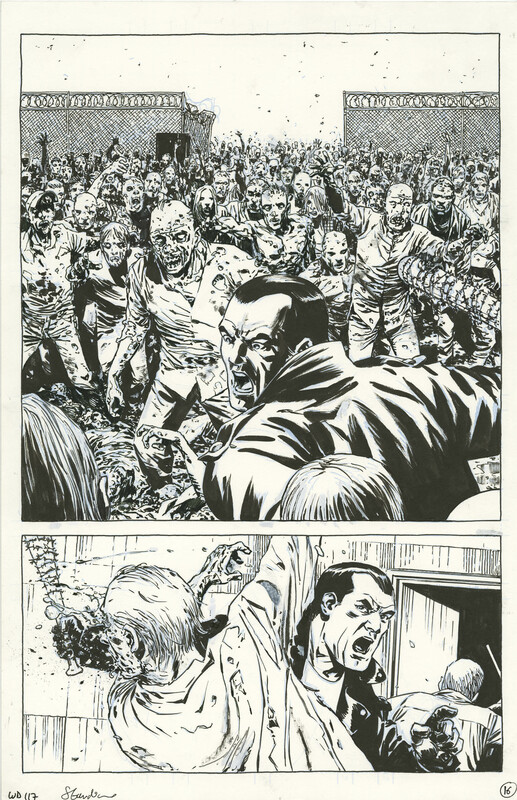 Adlard pencilled and inked WD #7 to #114 himself on single art boards, with Gaudiano inking on separate art boards from Adlard's pencils from WD #115 onwards. 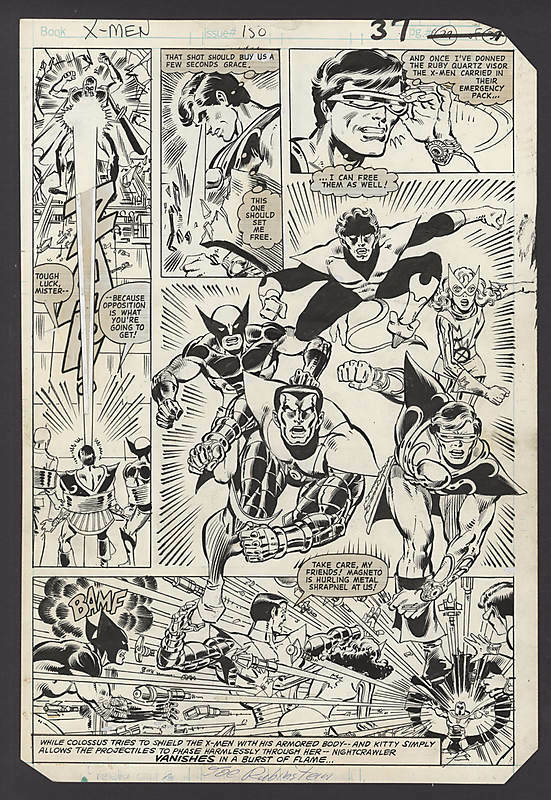 It’s pretty much established that JRJR first-run UXM panel pages now start at around $1k. JRJR OA prices in general are moving up, with his early runs on ASM, UXM, Daredevil and Iron Man leading the way. That’s one prolific artist! This and the Black Cat commission sold for $2.3k each, which seems to be a stable resale value for Hughes’ cheesecake pieces. Unpublished commissions generally resell for less than what the artist originally charged. 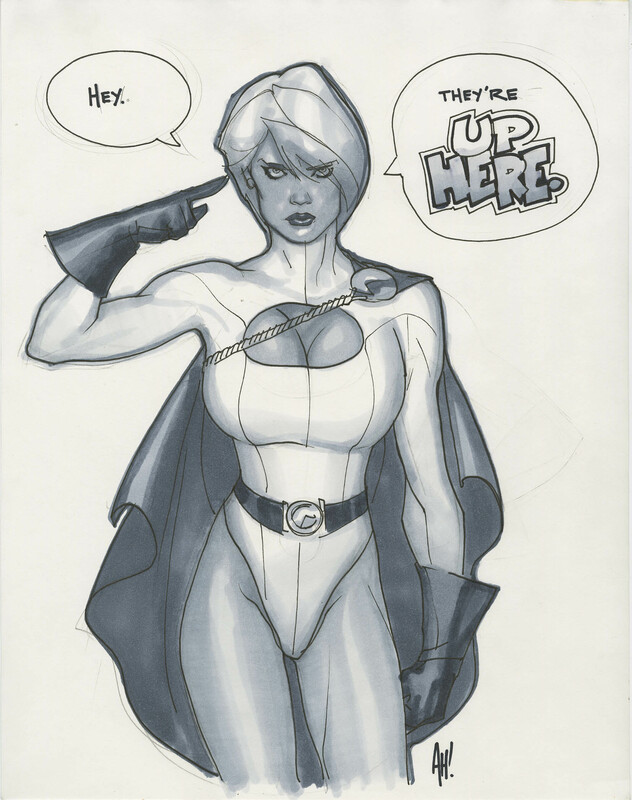 However, some in-demand pinup purveyors such as Hughes and Frank Cho do buck this trend. CC had a relatively small OA auction this round, though it did contain several choice Copper Age pieces that performed well. 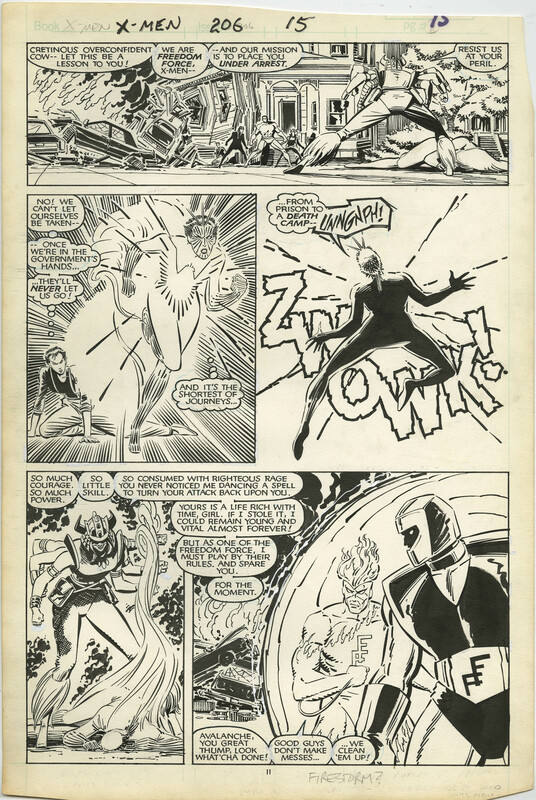 I feel $17.7k is a fair price considering the impact of Byrne’s FF run and his Galactus storylines in particular. Bold, iconic images of signature characters by master creators (in this case, Byrne and Sinnott) usually have long-term price upside. A landmark piece like this is no exception, and I can see it passing $20k in due course. What I said above about master creators, signature characters and iconic images applies here as well. $13.2k might seem high for a second-run Cockrum UXM page, given that average panel pages usually go for low to mid 4-figures. However, keep in mind that this page probably has some of the best X-Men images from Cockrum’s entire UXM run. I believe the strong performance of high-quality Copper Age pieces in the CC auction (including this $14,000 Magneto splash) is a sign of further maturation of the OA hobby. The widening price separation of truly “A”-level pieces from average ones indicates that OA collectors, as in other mature hobbies, are becoming more discerning and increasingly value top-grade pieces. I hope you found this report illuminating on several segments of the OA market; as always I’m happy to answer any questions you have. Just thought Id let you know I love your OA posts! I am an OA collector myself, I own 42 pages and a few commissions, although most of my collection consists of Walking Dead pages. Looking forward to your next article, keep up the good work! I also plan to do feature articles on OA collectors, so if you or anyone else would like to be featured, please let Inigo or myself know! I love these posts. I think I’m going to get addicted to OAs. I just bought my first OA yesterday……a Ms Marvel 3 cover done by Cliff Chiang. I’ve been doing a lot of research lately trying to track down OAs from my favorite series or specific cover arts but I’m finding that a lot of them were done digitally. Have you come across any list or website that shows whether artists do work with pencils or digital? I’m not aware of any list that tracks what medium artists work in. If you have a question, try contacting the artist or their art rep directly, or post your question in the OA section of the CGC Forum! That piece from Spawn #33 doesn’t look like McFarlane pencils. It looks like Capullo pencils and McFarlane inks. That’s fair. I’m sure McFarlane assisted somehow, but all I see are Capullo’s signature details used throughout the run….from the details on the gauntlets and boots to the way he draws the holes in the cape to the chains to the way the cape flows to even the way he draws the moon. But that’s just my interpretation of the art from what I’ve studied from both artists (my top two ever). Some great insights here, can definitely tell you’re a connoisseur of Todd’s and Greg’s work!